Sometimes there is a need in obtaining a static or public IP-address from service providers, but an Internet provider, for some reasons, may not be willing to give it to you. While so many Internet providers give dynamic IP-addresses, then DNS connection is sufficient, because an access will be ensured by a domain name; however many providers use NAT, in such a case DNS capability is useless. 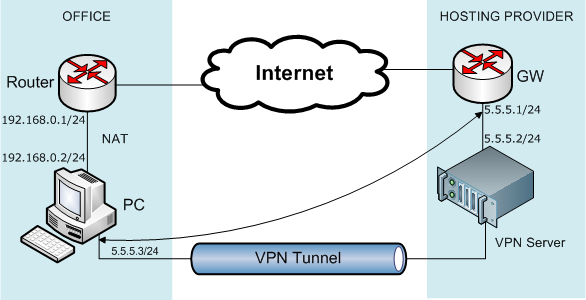 The solution is to forward a public or static IP-address through VPN; being connected to VPN, a computer becomes accessible from any Internet network point. Using OpenVPN it is also possible to forward IP-address range from one provider to another, from one country to another. The main advantage is securing the IP-address range even in case when you change a provider. Currently, due to depletion of IPv4 addresses, the above possibility is the almost sole one to obtain a provider-independent address range. In this tutorial we are looking at how to forward a public or static IP address from an openVPN Tunnel. From the diagram above the we will observe two routers with different configurations: one is coming from the ISP end while the one to access from is in our office. First of all we establish a connectivity between our two routers so that we are sure that we are able to route to our service providers gateway. Second thing we need to do, is to configure network address translation on the router in the office, using our LAN parameters. This configuration depends on the router Model and make. Lastly we have to put the device we will use on the same network with the router configuration by assigning a simple IP as above. Finally the service providers must have done their configuration from their end and then you will be able to VPN in an open Tunnel. ← How To Block Some Clients Using A DHCP Server On Mikrotik Routers.